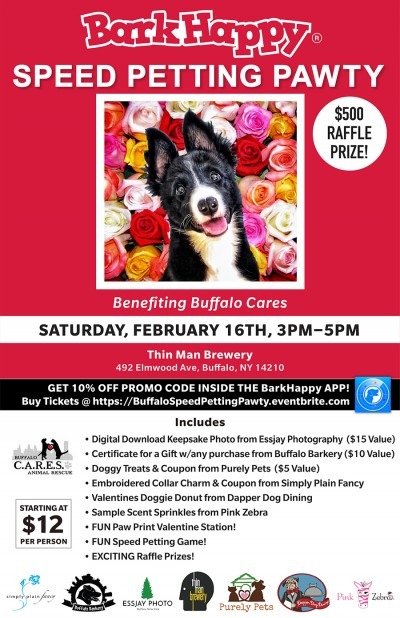 Grab your pooches, prepare for smooches, and join BarkHappy at Thin Man Brewery for a Speed Petting Pawty on February 16! Fill your complimentary goodie bag with plenty of freebies while shopping the many selections from our amazing sponsors! Don’t forget to grab your favorite brew at the bar before enjoying the Paw Print Valentine Station and Speed Petting Game! You’ll remember the love with a complimentary keepsake digital photo from Essjay Photography! Free Raffle Entry with admission and EXTRA Raffle Ticket for pooches &/or people dressed in the Valentines theme! Grab your tickets today to help benefit Buffalo Cares Animal Rescue, see you there! Don’t have a dog but love them? Help a great cause and let the petting begin, you’re more than welcome too! Early Bird Tickets are $12 per person and limited in quantity. Once sold out, General Admission will be available at $15 per person until sold out. No tickets will be sold at the door. FREE Raffle Prize Entry with each ticket purchase! FREE Embroidered Collar Charm & Coupon from Simply Plain Fancy! FREE Certificate for a Gift with any purchase from Buffalo Barkery! FREE Valentines Doggie Donut from Dapper Dog Dining! FREE Sample Scent Sprinkles from Pink Zebra! FREE Doggie Treats & Coupon from Purely Pets! FREE Digital Download Keepsake Event Photo from Essjay Photography! FUN Paw Print Valentine Station! WIN Full Photoshoot with your dog, at the location of your choosing and Printed Photo of your choice, Valued at $500 from Essjay Photography! EXTRA Raffle Ticket to any pups dressed for Valentines! This event will sell out fast! Tickets may be purchased in advance online on Eventbrite at https://buffalospeedpettingpawty.eventbrite.com – Again, our apologies, but no tickets will be sold at the door. RSVP in the BarkHappy Mobile App under “Events” and receive a 10% Promo Code in App! Please NOTE: This event is 21+. All friendly, well behaved dogs (and humans) welcome to attend! Dogs must remain on a non-retractable leash at all times please. This event will be held indoors (snow or shine) at Thin Man Brewery. As this is a benefit, we apologize, but no refunds are available. A portion of the proceeds will benefit Buffalo Cares Animal Rescue.